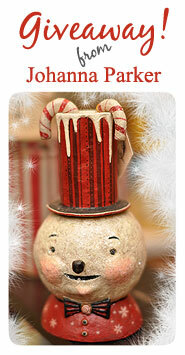 In the spirit of season, I am giving away one of my collectible reproduction, signed snowman candy cane stands! 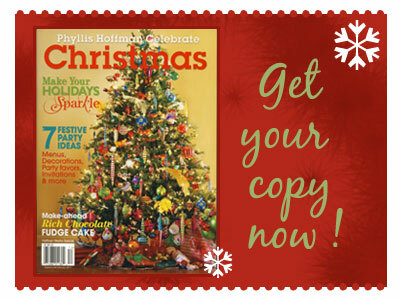 This adorable guy made the "Party Picks" section of Phyllis Hoffman's Celebrate Christmas Magazine! So, he's a wee bit famous :) He will arrive, signed by me the designer and will include 2 whimsical papier mache candy canes! 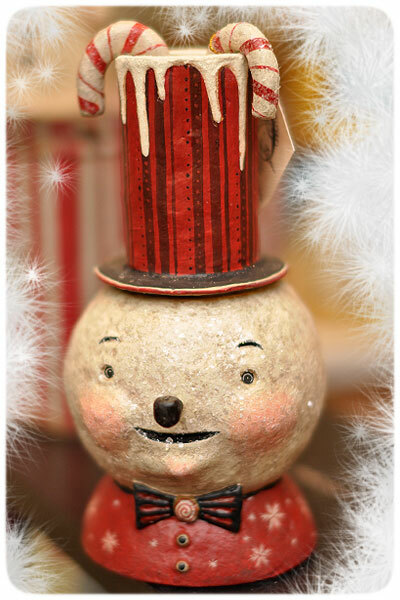 This cutie is about 9" tall, makes a jovial statement on your holiday table and is new this year from my line of winter delights produced by Bethany Lowe Designs. He's pictured below, so firmly visualize his image in your head, think positive thoughts and cross those fingers as he may soon be yours! Of course, you'll have to enter, and there are plenty of ways to WIN!.. The more ways you enter, the better your chance.... So, look for those details below. BEST of LUCK to you! * Winner takes home this collectible candy cane stand designed & signed by me! 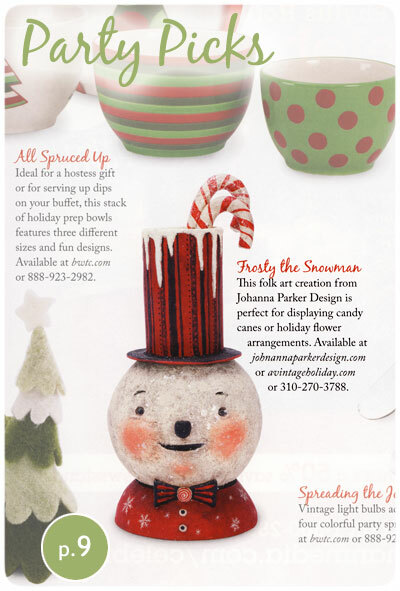 * Look for this cover at the store, and turn to page 9 to see my sweet snowman pictured amongst a fun mix of holiday Party Picks chosen by the staff at Celebrate Christmas Magazine! To order you copy today, CLICK HERE! The more ways you enter, the better your chances! 2.) Leave a nice comment for me here at the bottom of this post by clicking on the "Comment" button ( and no worries, you do not have to create a Blogger account in order to leave a comment - you can simply click the "Anonymous" option when leaving your message. But, just make sure that I can somehow identify you if you are chosen! ) IF you are unable to leave a comment here, you can email me, and I'll add your comment to the list below. 3.) If you have your own Blog and choose to spread the word about my Giveaway on your Blog, then I both thank you and welcome you to leave a 2nd comment here for a double entry! You can use the following Blog Badge to advertise on your blog's sidebar, or just grab the first, larger image above! 4.) Join my e-mailing list if you are not already a member. Just click on the "Email Johanna" link, top right of this page. (PS... the kind folks already on my e-mailing list will be entered as well, but I recommend those of you leave a comment, etc... to boost your chances of winning! OK!... So, as I said, there are LOTS of ways to enter!..... I look forward to reading your comments and hearing from you :) I will be posting the winner of this collectible SIGNED snowman candy cane stand in one week (Nov. 24th)!.... Stay tuned and spread the word, and a big thanks to all of my loyal collectors and artist friends who have supported me through the years. Cheers to you! !